The advertising industry has a major morale problem, and it's not going to go away on its own. Campaign US recently conducted the Second Annual Morale Survey for 2016, and their findings reveal a staggering decline in overall morale among agency employees. Along with slipping morale, the study also uncovered a troubling host of symptomatic issues, such as talent retention and a decline in employee performance. So what are the root causes of this morale problem? What impact will it have on talent retention? 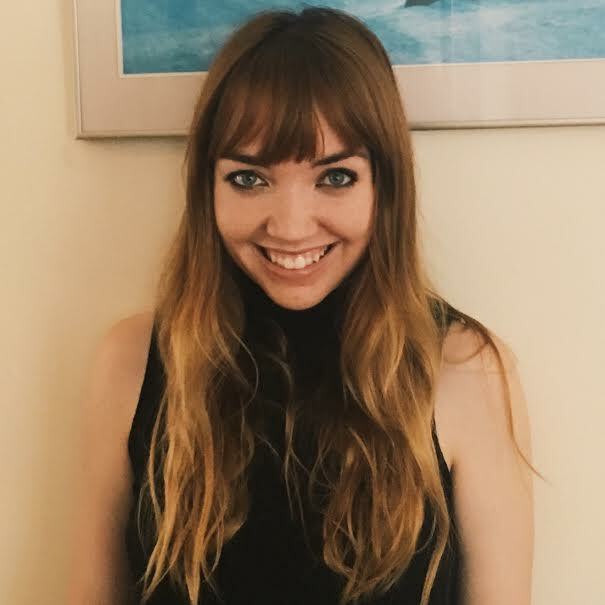 What areas of employee experience do agencies need to make an effort to improve? To help agencies tackle these questions and visualize the challenges in front of them, we created the following five charts based on the Campaign US survey results. Check them out below to see the far-reaching effects morale has on the industry. 1) Overall morale among agency employees has steeply declined. When Campaign US conducted their first Annual Morale Survey back in 2015, only 34% of employees said their morale was either low or dangerously low. Those numbers were alarming at the time, but they haven't improved -- in fact, morale among agency employees has experienced a distressing decline in 2016. This year's survey results found that 47% of agency employees report either "low" morale (31%) or "dangerously low" morale (16%). 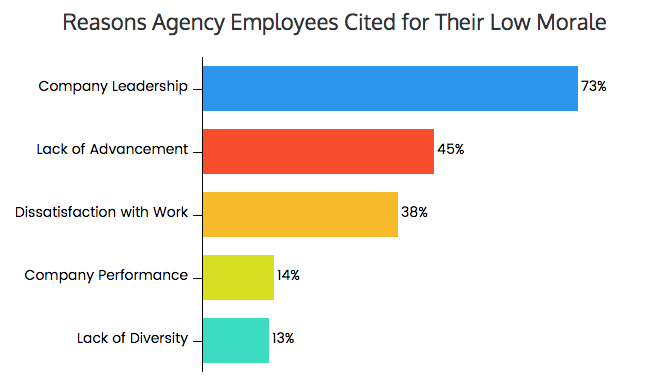 That's a 36% drop in overall agency employee morale between 2015 and 2016. 2) Agency employees with low morale also reported dissatisfaction with leadership and advancement. So what factors are responsible for this drop in morale? Survey participants who reported having "low" or "dangerously low" morale were asked to explain the reasons behind their responses. The top factor contributing to low morale was a dissatisfaction with company leadership, followed closely by a lack in advancement opportunities, and a general dissatisfaction with work. Less impactful were overall company performance and diversity. 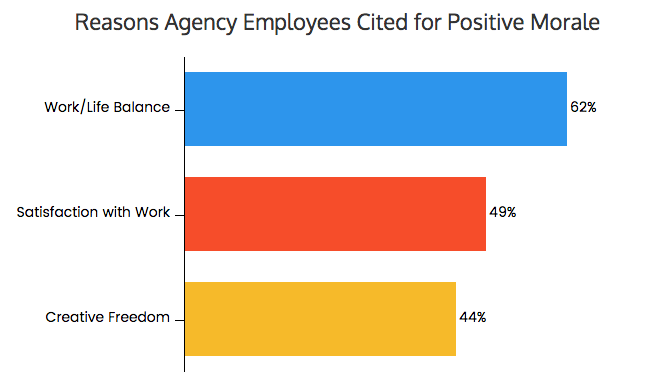 3) Work/life balance is the biggest factor for agency employees with good morale. Of the 53% of employees who reported "satisfactory," "good," or "excellent" morale, "work/life balance" was the biggest influencing factor. The other two big contributors to positive morale were "satisfaction with work" and "creative freedom." 4) Agency employees affected by low morale are ready to walk away. 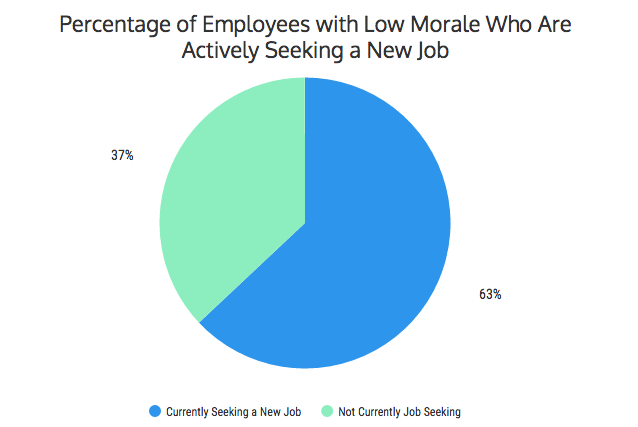 If any agencies still needed a wakeup call, this is it: 63% of employees who reported low morale were also actively seeking a new job. That means a whopping 29% of agency employees are looking to leave their current positions -- which puts agencies in a precarious position. 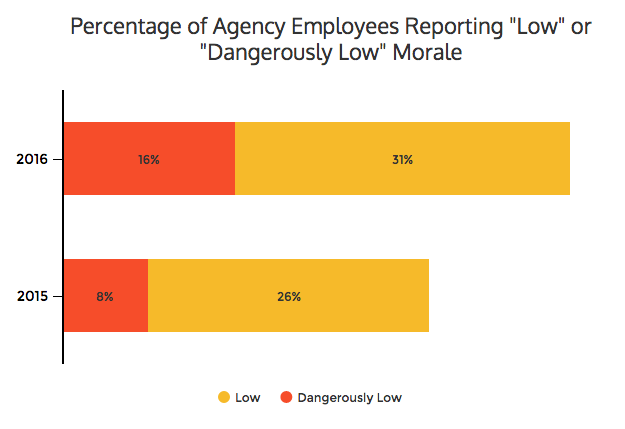 5) Low morale has a massive impact on agency employee performance. 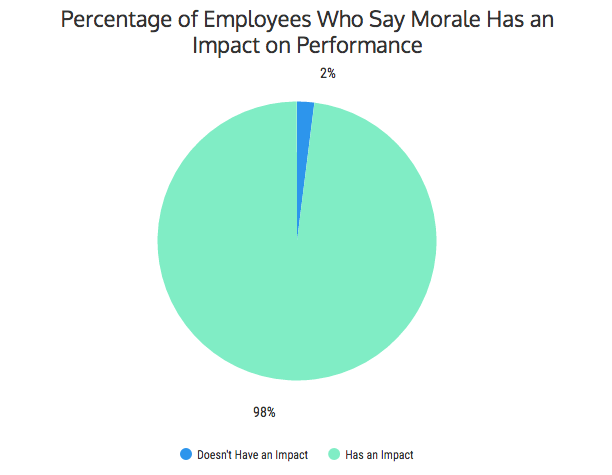 Unsurprisingly, morale has a major impact on overall employee performance. Regardless of whether they reported high or low morale, 98% of respondents said that morale had an effect on their performance. If employees don't feel their needs are fully supported, their performance takes a hit. 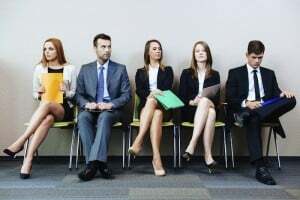 With nearly half of all agency employees reporting low morale, this could spell disaster for the ad industry's bottom line. How is your agency planning to boost morale this year? Share your advice in the comments.